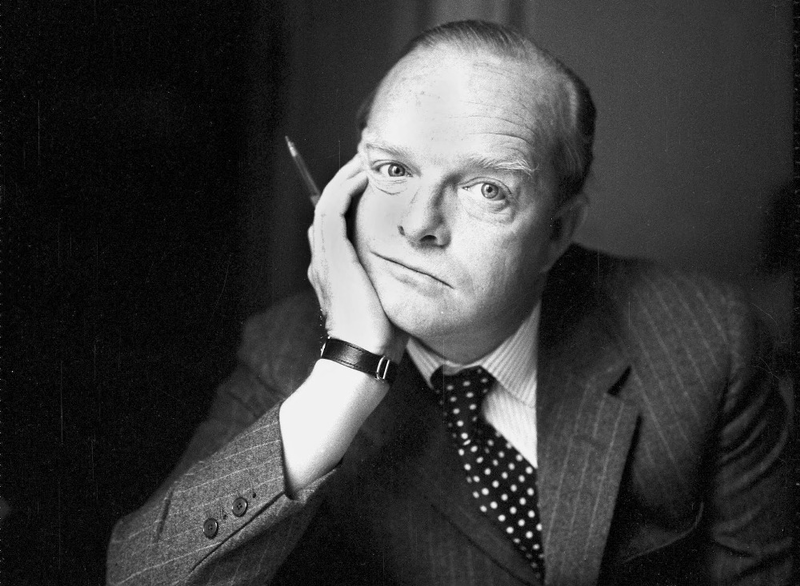 As it stands, Truman Capote is the type of writer whom everyone has heard of but whom few people actually read (myself included), at least not without it being required. It is his being, his persona, that is mostly remembered. Two films explore the author's life while creating his most famous work: In Cold Blood. The second to be released was Infamous, and beating it to the punch is the first version, titled simply Capote. Both cover the same ground, and another time I'll discuss the two versions. For now, I can say that Capote is a masterwork, a portrait of the artist as a middle-aged man. Truman Capote (Phillip Seymour Hoffman) notices an article about the killing of a family in western Kansas. He goes there with his friend, fellow novelist Nelle Harper Lee (Catherine Keener) to do research on an article on how the murders have affected the citizens. He clashes with Kansas Bureau of Investigations officer Alvin Dewey (Chris Cooper), but eventually becomes friendly with him and his family. As he becomes more fascinated with the crime and with the denizens of Holcomb, KS, he expands his article into a book, and after the killers, Richard Hickock (Mark Pelligrino) and Perry Smith (Clifton Collins, Jr.) are captured, Capote's fascination grows. He begins a relationship with them, and the one with Smith becomes extremely close, much to the displeasure of Capote's companion, Jack Dunphy (Bruce Greenwood) and concern of Lee. The success of Lee's To Kill A Mockingbird and Capote's struggle both with the book (which he calls In Cold Blood), his jealousy of Lee's success, and the conflicting emotions that Hickock and Smith's deaths stir in him, all play havoc with his life. Eventually, Capote does finish In Cold Blood with great success, but after that, he flies into the unknown, never to complete another work. 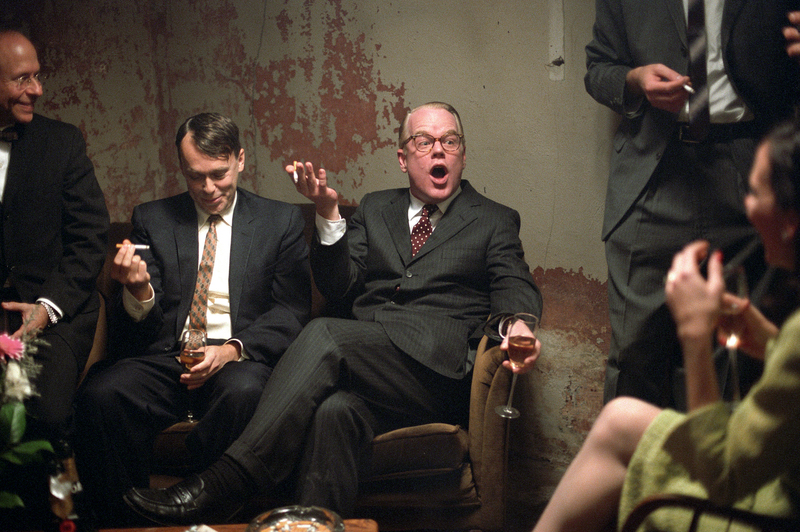 Director Bennett Miller creates a very sparse, quiet film with Capote. There is a conscious stillness throughout the film, especially when they are in Kansas, matching the endless vistas of the state. There are no big, elaborate scenes, and almost all the performances are quiet, soft. Even the sets are sparse: few pieces of furniture are seen. This isn't a flaw, it's actually a plus. We focus more on the acting and the dialogue (the script written by actor Dan Futterman), and we're given a quiet story about how a horrible crime brought down so many, not just the victims but the killers and even their chronicler. The performances match the stillness and quiet of the film. 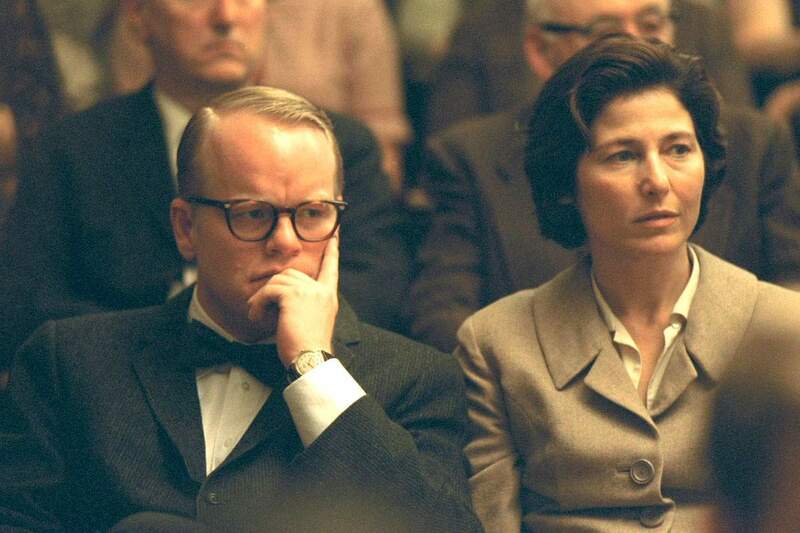 Hoffman captures Capote's babyish voice and mannerism, but it's not an imitation but a thorough character study. The scene when he attempts to gain Smith's trust by talking about how his mother was so similar to Smith's is brilliant, this performance of someone opening up to someone so beneath his social status is raw and deep. It's amazing that Hoffman should in a sense, never have played Capote. The actor is considerably taller than the writer, but Hoffman showcases Capote's ego, intelligence, and despair. It is one of Hoffman's best performances. Keener is perfection as Lee: a woman who appears to retreat into the shadows even at the height of her success with the book and film adaptation of her only published work. She lends a quiet support to Capote/Hoffman, a person who cares for her friend but cannot ultimately break him out of the prison he himself created. Collins' Smith is still a bit of an enigma, someone we really don't know or ever are able to. Perhaps that is how it was. Cooper is all business, all serious as Dewey, one who grows to like Capote (in spite of not knowing anyone like him) but who knows his first loyalty is to the law and who is genuinely hurt and angry that Capote would help, let alone befriend, these murderers. If there are flaws in Capote, it's that the trial of Hickock and Smith were very rushed to the point of being non-existent. We also get very little of the relationship between Capote and Dunphy. However, there are more pluses than minuses. One of my favorite scenes is when Capote has a reading of In Cold Blood: the power of the words, and the trust Miller and Futterman have in the audience to appreciate Capote's work and have his writing hold our attention is excellent. Capote isn't a biopic since it doesn't cover the lifespan of Truman Capote. It's an elegant portrait of a literary giant (no pun intended) who achieves his goal, one that has a terrible and tragic cost. The film is about the process of creating, and how even a person with extraordinary gifts and a joie de vivre can be brought down when reality does become stranger than fiction.